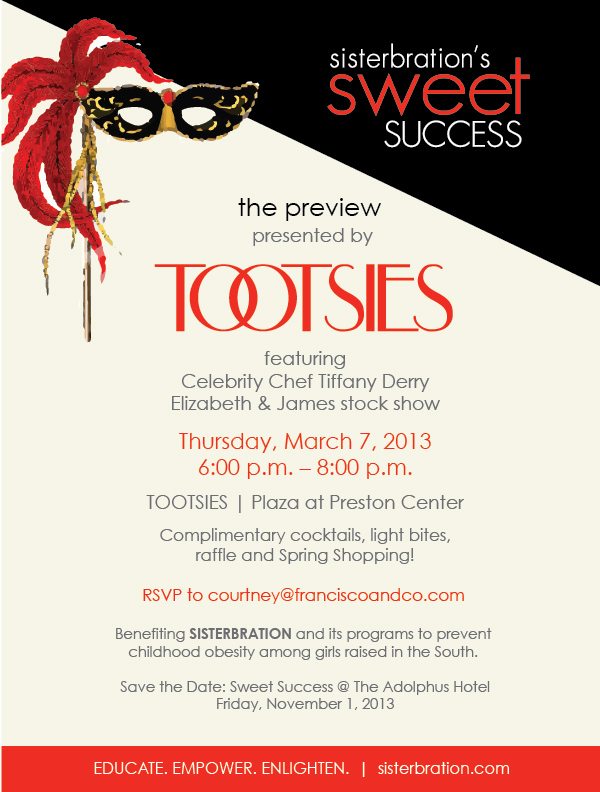 TOOTSIES will host Sisterbration’s Sweet Success PREVIEW Party on Thursday, March 7th from 6pm-8pm. Enjoy Elizabeth & James Stock Show, cocktails, light bites inspired by Celebrity Chef & Honorary Sweet Success Chairwoman, Tiffany Derry, raffle and Spring Shopping! Benefiting SISTERBRATION and its programs to prevent childhood obesity among girls raised in the South. SAVE THE DATE for Sweet Success 2013 on Friday, November 1, 2013 at The Adolphus Hotel. Sisterbration promotes healthy lifestyles by educating women and girls about preventable diseases like cancer, diabetes and heart disease. Their approach to women’s health is to raise women’s awareness and help them reduce their risks. With girls, however, they focus their intervention strategies on childhood obesity by inspiring girls to develop positive self-esteem, make healthy food choices and engage in regular physical activity. They believe that every woman – and girl too – deserves an opportunity to find her voice, achieve her full potential and celebrate a life defined by wholeness, wellness, and service. They believe that every woman deserves to celebrate in the face of negativity. Thus, this community of women called Sisterbration is leaving its “heart print” on the lives of women and girls around the globe with programs that span the United States and Africa. Their mission is to educate, empower and enlighten women and girls to adopt and maintain a healthy lifestyle. TOOTSIES is located at 8300 Preston Road #200 Dallas, TX 75225. RSVP to courtney@franciscoandco.com. Complimentary Valet on Preston Rd. Self-Parking UP Library Parking Garage.